HAPPY NEW YEAR TO ALL OUR CANADIAN MEMBERS & HONOURARY CANADIANS & FRIENDS OF CANADIANS and of course, everyone else who writes on or reads this SFG Forum . Nearly 7:00am where I live, and looking out the window, my expectation of a foot of snow so that I can go snow shoeing has taken a dive. It is snowing, just, and I reckon we have about one centimetre of new snow on the ground, so that puts the lid of any chance of snow shoeing around my block today. At least it means that local people will be able to walk and drive without any problems, and the snow plow people can have a pleasant New Year's Day with their families. Thanks KJ for all that you do for the Canadian Region and for keeping all members informed with your SFG related input as well as your amazing personal experiences. May you a have a really wonderful 2017. TD, I hope we ALL have a wonderful 2017. And what about your experiences, TD. I have enjoyed your flying experiences showing us pictures of our surroundings in a way we have never seen before. All your pictures and details of your experiments and now your forum contributions in making this forum tick along. My personal; beef is that you have taken most of the snow and with our local roads scraped clean by the plows, I cannot snow shoe today. @Kelejan wrote: TD, I hope we ALL have a wonderful 2017. And what about your experiences, TD. I have enjoyed your flying experiences showing us pictures of our surroundings in a way we have never seen before. All your pictures and details of your experiments and now your forum contributions in making this forum tick along. KJ ... the interesting thing is that the more I've gotten into SFG the less online flying I do. It's something I need to get back to. TD, next time you go for a flight would you mind taking a look down in North Miami, Florida, along the west coast of Biscayne Bay at Northeast 135th Street to see how my apartment complex is holding up please? It was canary yellow last I saw it 11 years ago. @CapeCoddess wrote: Happy New Year, Canada! CC ... the flight simulator only provides guestimated scenery unless I purchase and install photoreal scenery. I currently only have photoreal scenery for New Hampshire and even so it's not that good once you get down low to the ground. @trolleydriver wrote: Thanks KJ for all that you do for the Canadian Region and for keeping all members informed with your SFG related input as well as your amazing personal experiences. May you a have a really wonderful 2017. TD and Kelejan, you are both amazing. Can't wait to see what 2017 has in store! To my Eastern and Western Canadian "cousins" I'm so glad the Canada Region is active. It's pretty cool here right now by my standards, -13C rising to -7C later today but I am not complaining as the Lower Mainlanders are much colder with a very high windchill due to the Arctic air sweeping down on that portion of British Columbia. I am hoping that the road and the tunnel are clear and not icy. The temps will be well below freezing for the for-seeable future and then several days of snow begin Friday; I may get my snow shoeing in yet before the snow melts. I have put off walking to the grocery store but there comes a time when needs must as I am craving some green stuff to eat that is fresh. I just fancy a nice salad to go with the ham I have, also I have run out of my favourite tea, and reduced to what I have been given over the holiday. This is when I realise that in spite of my store cupboard, I really do not want to live on tomato sauce and spaghettie for too long. When I return I will take down my "decorations" that consist of strings of many Christmas cards from past years. It has made quite a neat show and I can read each card as I take it down and remember all those family and friends. I lost two good friends last year, but in walking around during the Christmas season I have bumped into two other friends who have returned to live here so we will get together and do a catch up and hopefully we still have things in common that we can do together. Be careful in those wintery conditions KJ. We are getting freezing rain again today. Ice is accumulating on the power lines so I am hoping we do not get a power outage. I'm already fed up with this winter and we have a long way to go yet. Mrs TD took down our Christmas tree and other Christmas stuff today. So the house is getting back to normal. The outside Christmas lights will remain for a while longer. In fact, they probably will remain in place for two or three months but we will only be turning them on for a couple more weeks. Yesterday I broke my second French Press coffee maker in two months. I've decided to go with an Aeropress. So I splurged on Amazon for an Aeropress as well as a manual coffee grinder. It's total overkill for someone who drinks only one (at the most two) cups of coffee per day. On top of that, I'm the only coffee drinker except when my daughter-in-law visits and she takes a cup. Last year they lost three of them so it was not a good time for them. I had been involved since 1982 when I first rented a storefront from them, so now nearly all that generation has passed on and I am still on very friendly terms with the next generation. Then on the way home I called in to the Mitchell's Timber place to ask if they would cut wood to size for me and they said they would be happy to do that for me. They did not mention me buying the wood from them but I assume it is a given that I do, especially as my needs are small; no building houses for me. I saw a wheelchair bound gentleman who often waits at the top of the tunnel and talks to people as they are on their way home. I had not seen him lately due to the weather so I was glad I went in. I forgot to say that it was the best walking conditions I have ever seen here, due to the fact we have not had the usual thaw and freeze cycle. I hope it stays like this at least until the snow returns. The sunshine really does brighten up peoples' feelings and brings a smile to their faces. @Kelejan wrote: I have now returned from a most enjoyable walk . . . The sunshine really does brighten up peoples' feelings and brings a smile to their faces. I bet you contribute to the sunshine around there. It was super strangely foggy here today all day, and yesterday to a lesser extent. Dark. I too will take cold and sunny over coldish and dark. So far this winter we have received 150 centimeters (59 inches) of snow plus freezing rain. Fortunately it has not accumulated to that depth. But enough already!!! @trolleydriver wrote: So far this winter we have received 150 centimeters (59 inches) of snow plus freezing rain. Fortunately it has not accumulated to that depth. But enough already!!! Gruesome! I sure hope that's not what heading this way. We're expecting up to 3" tomorrow and up to 5" on Sat. That's enough! We are supposed to get our first snow this Saturday. At least 1 inch. Atlanta will come to a standstill with 1 inch of snow but this time it is coming on a weekend so that might keep things a little calmer. Still no snow today, but maybe beginning tomorrow night. We are having much better weather than Vancouver, where some people are are fighting over buckets of free salt. The trouble with Vancouver etc. is that they are not geared up for this Arctic outflow which has been there for some days and causing havoc on the roads, side roads and sidewalks. When the warmer weather arrives and the snow melts then there might be floods. I caught the bus this morning to get stocked up on bread and more fresh veggies, then home with no trouble. Yesterday was not so pleasant with the wind whipping up the soft snow and blowing into one's face. Tomorrow, bus to Seniors' Centre. Snow forecast starting in the afternoon, I hope to be home and with no need to venture out for a few days. Keep safe and warm, everyone. My snow shoes are gathering dust. Snow forecast starting tonight, but I will believe it when I see it. Still, walking conditions along our sidewalks are excellent due to the snow not thawing. I will be out shortly to catch what is left of the sun and will need to take my sunglasses. Minus 13C early this morning, and supposed to warm up to minus 6C with no wind. I decided to check on the combustion air inlet for our gas furnace. Sometimes it can get clogged if the snow is too deep and then the furnace will not come on. We got a new furnace and the installer put the inlet higher so that we don't have that problem. Now there is a new thing happening. The combustion air from the furnace contains a lot of moisture. When it comes out of the outlet pipe and hits the cold outside air then the moisture condenses. 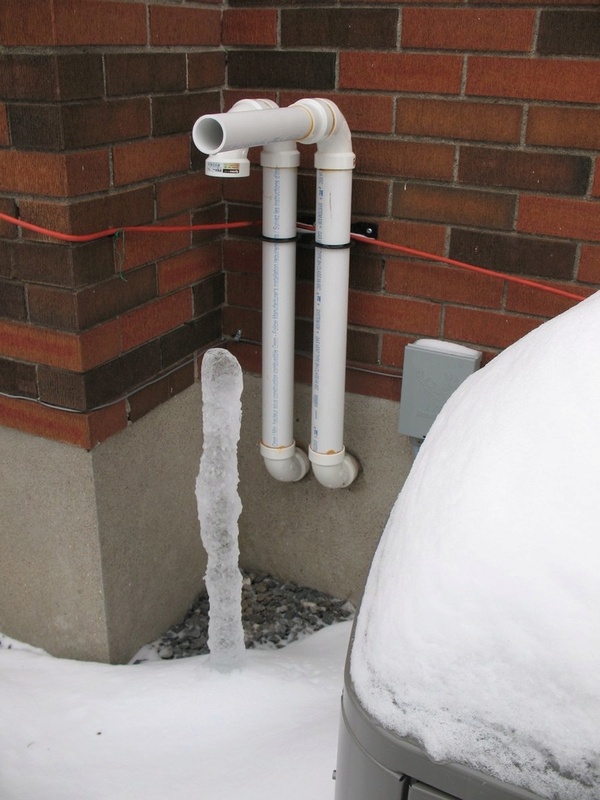 So now we have an ice stalagmite forming under the air outlet. This one is about 2 feet high. We are expecting another snow storm tomorrow. The snow finally arrived, enough to go snow shoeing. The only trouble is that after taking an hour and a half completely clearing the driveway, there was not enough energy left for further activity. Snow forecast for the next four days. Maybe tomorrow I will get some snow shoeing done. Instead, I paid some attention to the peony seeds that I have been trying to sprout since last may. A total of five seeds have some nice roots so I potted them and put them under my AreoGarden lights. The rest of them, although not showing any sign of life, did not show any sign of death, (rotting) they still looked nice and plump, so they have now been transferred to the fridge to see if anything happens. I live in hope. PS After working clearing the snow, I feel good. I have not overdone things as I take smallish bites and bend my knees and hold the shovel-head of snow close to my body using that as a fulcrum to tossing it to the side. Otherwise I push the shovel in front of me and let the ground take the weight. TD, that actually looks kinda cool. As long as it doesn't grow so large as to block anything! Sad time in my neighbourhood. A man three houses down from us and another man from the house right behind us died from strokes in December. Both were in their late 70s. I only just found out about the second man when I stopped to talk to his wife on my "daily" walk. That could cause a lot of trouble. I am sure that TD will allow it to grow only so far just to see, and chop it off in time. TD, sorry for the sadness in your neighbourhood. Today is nasty, cold and very windy, blowing the snow off the roofs causing a white-out at times. Looking out my side window, the blowing snow has at times stopped me seeing my neighbour's house, which is at least 60 feet away. All the garden is now a smooth expanse of wind-driven snow and all the animal and human footprints no longer exist. I checked the weather forecast and it includes 30kph winds which explains the state outside. So far, no walkies today unless the wind drops. @Kelejan wrote: All the garden is now a smooth expanse of wind-driven snow and all the animal and human footprints no longer exist.